Following the recent Meeting of Minds conference, photographer and blogger Malcolm Ragget’s posted his personal summation of the weekend. 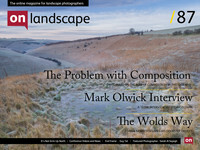 In a thought-provoking article, Malcolm calls for landscape photographers to broaden their horizons and consider metaphor as a key ingredient of a good photograph. Toward the end of the post he makes a plea for “…delegates to think more deeply about their photography, to let go of the camera-as-craft and use it as a tool of enquiry…” The notion of letting go of “camera-as-craft” really struck a chord in me – although not, perhaps, in the way that Malcolm intended.